Breville makes some of the best espresso machines on the market and are renowned for the attention to quality and detail. The Breville BES870XL Barista Express is a fine example of a quality Breville product delivering commercial quality at a consumer price. If you are looking to produce cafe quality espresso at home without taking out a loan to pay for it—the Breville BES870XL might be your new best friend. Coffee house espresso is amazing, and our entire society would likely crumble should it disappear. It’s delicious, frothy, energizing blend of delicacy and caffeine help get the day started for millions around the globe. Not everyone lives next to the best coffee house however, and finding a quality source of espresso can be difficult. Many quality espresso machines range in the thousands of dollars, and are cost-prohibitive for most buyers. Espresso machine brands like Breville have taken it upon themselves to consolidate some of the features of their best espresso machines into more affordable residential models. The Breville BES870XL Barista Express is Breville’s likely the best espresso machine in this category, and offers access to many notable features. The Breville BES870XL comes with an extensive set of features capable of producing quality espresso as close to commercial coffee house style as you’ll likely come. This is by no accident, and Breville’s astute attention to detail and rich feature set make this possible. As simple as many of the best local espresso shops make it seem, producing quality espresso can be quite tricky. Temperature, grind sizes, steam wands, and infusion pressure all play integral roles in producing a quality espresso. To see a full-listing of the features offered by the BES870XL, you can read through the official manual made available by Breville. Below, you’ll find a listing of some of the features the Breville BES870XL includes to address these vital necessities during the espresso making process. The Breville BES870XL features a stainless steel conical burr grinder to help maximize total grinding effectiveness. This grinder features upper and lower burrrs, which are both completely removable for cleaning. The grinding features of the Breville BES870XL also accommodate grind size (from coarse to fine) as well as total grind amount—offering consideration for different densities produced from different grind sizes. When making espresso you’ll likely want to have different amounts available to you, depending on the day that looms before you. The Breville BES870XL offers an automatic dosing feature which accommodates single or double dosing, measurable on a cup-by-cup basis. This useful feature is driven by the precision control offered by the Razor dose trimming tool—capable of trimming down the puck to the required level for consistent extraction. Espresso is victim to fluctuations in temperature, and this aspect is where many ‘affordable’ espresso machines fall short. The Breville BES870XL takes many measures to ensure you are able to control and monitor the temperature throughout the entire espresso-making process. This espresso machine offers an adjustable temperature control system to allow controlled fluctuations to accommodate different flavoring techniques. This system is founded on Breville’s PID temperature control and thermocoil heating technology. Each of these systems integrate into the function of the Breville BES870XL to allow maximum temperature control and variance (when desired) throughout the whole process. There are many factors that go into controlling the flavor and quality of an espresso machine’s end product. Pressure throughout the system is one that often goes overlooked, but certainly not by the Breville BES870XL. Temperature plays a large role in producing pressure, as steam from hotter water can increase overall pressure. The temperature-control features mentioned above help maintain an audit of this factor well, as well as the mult-cup variance selection features. The Breville BES870XL offers a pressure gauge as well, so you can monitor any fluctuations from different choices in settings. Feature lists are useful in imagining the longevity and quality of a product, but don’t quite serve to imagine the experience offered by a product. The Breville BES870XL is much more than the sum of it’s features, and it’s intuitive design and beautiful aesthetics serve well to transform your kitchen into a full-service cafe. The Breville BES870XL is made almost entirely of sleek stainless steel with soft curves and rounded edges. The 360-degree swivel action steam wand can be used to add an artistic energy into milk texturing and froth design as well. It’s 54mm portafiler has commercial style spouts that branch outward to produce the dynamic swirls you are accustomed to seeing. The Breville BES870XL also has a removable wet/dry drip tray that has a floating notification system that indicates when it is nearing it’s limit! 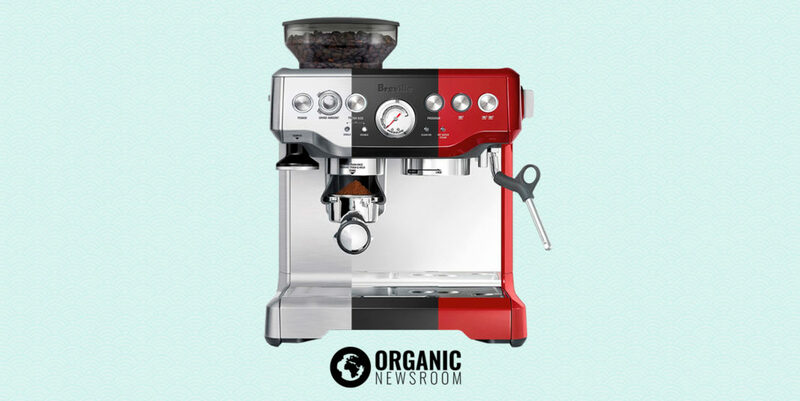 Espresso machines are often expensive and egregiously-priced appliances which, in many cases, land far from being able to deliver the coffee house quality that many demand. Breville is renowned as one of the best commercial espresso machine brands, and their Breville BES870XL integrates much of that technology into a more affordably-priced option for at-home use. They offer a large line of quality products, such as the Breville 800JEXL Juice Fountain, and their brand name has become synonymous with quality kitchen appliances. Cafe-quality-espresso at home can change the quality of any coffee-drinkers life drastically. Powerful temperature control, automatic measuring, and commercial-style filters allow the Breville BES870XL to offer a close-to-cafe experience. The Breville BES870XL Barista Express is available from Amazon, where it has received an excessive amount of 5-star reviews. Coffee House espresso helps the world go 'round. Commercial espresso machines can cost an arm and a leg, and are often beyond the budgets of many homes. The Breville BES870XL offers commercial espresso quality in an affordable price range.